1) download it, ensure you've got a DS linker ready. 4) launch the .nds file with your linker. Click the limbs on the central area to select them, then move them around with the stylus or the DPAD. press L to de-select the current limb. Press Y to copY the current frame and edit the next (copied) frame. When no limb is selected, press UP or DOWN on the DPAD to move from frame to frame. Press LEFT or RIGHT to move the selected frame around the timeline. 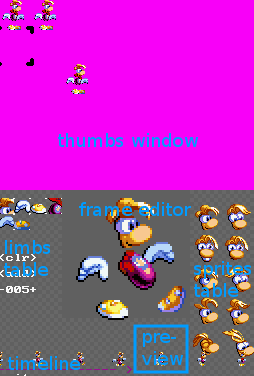 Use the limbs miniature on the left to select a limb more accurately or to make its associate spritesheet appearing on the right. Touch one of the sprites on the right sheet to change which image is displayed. press R-R to write back that animation to the "thumb window". When the thumbs window is displayed (pressing R once) on the bottom screen, use DPAD to select an animation slot, A to load it in the editor, R to save the editor's content and L to return to the editor without writing back. press START-R-R to save back your work. AnimEditor v0.2 is still hard-coded for a specific layout of the .spr file (esp. regarding which page to use for the different limbs). This may result in odd content displayed on screen before you load a file. AnimEditor Neo Compo 2012 Release NEWEST!